We keep having these persistent science database crashes. It's a real pain! Despite how bad this sounds, this shouldn't greatly affect normal work flow as we get on top of this. Yesterday we had the third crash in as many weeks, always failing due to some corrupted index on the result table that we drop and rebuild. Not sure what the problem is, to be quite honest, but I'm sure we'll figure it out. 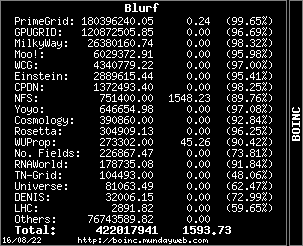 The BOINC (mysql) databases are fine, and the Astropulse databases are operating normally. Lots of internal talks recently about the current server farm, the current database throughput situation, and looking forward to the future as we are expecting a bunch more data coming down the pike from various other sources. Dave is working is doing a bit of R&D on transitioning to a much more realistic, modern, and useful database framework, as well as adding some new functionality to the backend that will help buffer results before they go in the database, so we can still assimilate even if the database is down (like right now). None of the above is an April Fools joke of any sort. Not that you should have read it that way. Message 1660522 - Posted: 1 Apr 2015, 23:11:59 UTC - in response to Message 1660519. And tell the team that new graphic on the Home page telling where units are going to and coming from around the world is fantastic . Message 1660525 - Posted: 1 Apr 2015, 23:21:31 UTC - in response to Message 1660519. Matt may I make a suggestion? The system always seems to have problems occurring from weekly maintenance. How about try to throw the servers into maintenance mode, then bring them back up in 10 minutes? And see if there is a problem with the code, don't touch the Db, just in and out of maintenance. Pick a time when everything is running smoothly and kick it. Might sort down if it is a server problem or Db problem. Message 1660704 - Posted: 2 Apr 2015, 11:33:59 UTC - in response to Message 1660525. Thanks for that update, and the above suggestion sounds reasonable to me, but maybe you guys came up with that try sometime ago. And isnt it about time you gave us some recent work to crunch, in stead of feeding 2 year old workunits back into the field? If hardware replacements/upgrades are so urgently needed, why not do a long-term Bitcoin Utopia to raise funds to buy what's needed? Message 1661299 - Posted: 4 Apr 2015, 3:45:46 UTC - in response to Message 1661264. OK this is all most in the bull s^)& mode WTF there should be a update by now on the tech news about what is wrong THIS time!!!!!!!!!!!!! I love the work everyone is doing for Free. But why keep everyone in the dark!!!!!!!!!! till seti can be back UP!!!!!!!!!!!!!!!!!!!!!!!!!!!!!!!! Message 1662976 - Posted: 9 Apr 2015, 10:03:00 UTC - in response to Message 1662972. Matt posted yesterday in the Number crunching forum. Message 1662994 - Posted: 9 Apr 2015, 11:42:48 UTC - in response to Message 1662976. Message 1663032 - Posted: 9 Apr 2015, 13:25:53 UTC - in response to Message 1662994. Because he only wanted to take time out from doing the real work to post once, and that thread is most commonly used by the regulars for asking questions about what's going on. Once a post has been made, Matt can safely leave it to the rest of us to link/re-post wherever needed, and that's been done in a few other places already by other users. Message 1663133 - Posted: 9 Apr 2015, 17:09:00 UTC - in response to Message 1663032. And I think that it is a great thing that he posts where the majority of us bounce off of each other with problems. He has picked up some feedback in the past by posting in and reading bits in the Panic Mode thread. Message 1663190 - Posted: 9 Apr 2015, 19:52:10 UTC - in response to Message 1663133. "It is often darkest just before it turns completely black." Message 1663504 - Posted: 10 Apr 2015, 8:30:51 UTC - in response to Message 1663502. LOL...everything is under database repair. For a few days maybe, no WUs for anything. Except for maybe a few resends of WUs already in the system that have not been sent back in time.